Life coaches stake a claim to a piece of Zuccotti. Photo via Coaching Visionaries. At the edge of Zuccotti Park amid a sea of signs and a crowd alternating between snapping pictures of the cardboard handiwork and creating some of their own, a girl in her mid 20s walked up to a plain folded table covered in printed sheets of paper. It was about 7pm on a Friday and the post-work crowd of gawkers and evening tourists had swelled the park population significantly so she had to speak up a bit to be heard over the din. A girl behind the table stuck her hand out to interrupt her: “Same for me,” she says, smiling and nodding. She’s bubbly and energetic, wearing the kind of comfortable suit you might expect to see at a public relations staff happy hour. Without missing a beat, the girl behind the table starts pulling papers out of the stack and makes an elevator pitch about a planned art exhibit outside the JP Morgan building that needed artists. “Cool,” the first girl responded, seeming shocked to have found such a quick answer, and a place she could go. Is this the central booking for all newcomers to Occupy Wall Street? Not exactly, because it goes a bit deeper than that. The table is staffed by a team of about eight professional, certified life coaches with the goal of helping newbies not just find something to do — after all, anyone can sling a plate of free vegan pizza at the chow line — but to tap into something deeper that draws out their life skills. If Occupy Wall Street is meant to be a national come-to-Jesus sermon, this table is the private confession booth. Dead Prez lyrics in the sign corral, near the life coach table. Photo by Tim. 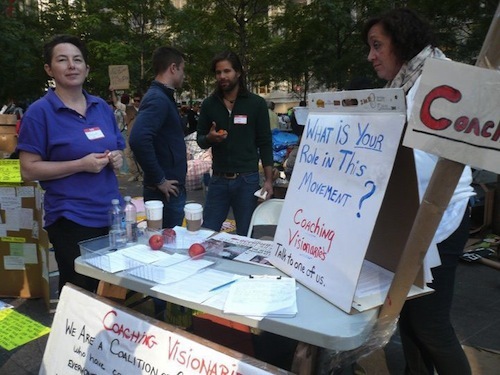 The station — under the name “Coaching Visionaries” — was set up Oct. 4, after many of the coaches had already spent a week in the thick of the protest (including a few who were arrested on the Brooklyn Bridge). The table wouldn’t look out of place at a career fair or networking event, noticeably absent of the dreadlocked, bandana-clad crowd banging drums on the opposite end of the park or the guys in overalls and sandals rolling cigarettes en masse in another corner. But the coaches share qualities with the movement overall, in the general collective exasperated huff they faced with the job market, especially in a field whose vitality is dependent on others’ disposable incomes. Most of the eight regular coaches just graduated a nine-month certification program a few weeks ago; some were laid off from other jobs. Michael Badger was a professional dancer before he entered the coaching training program last year. 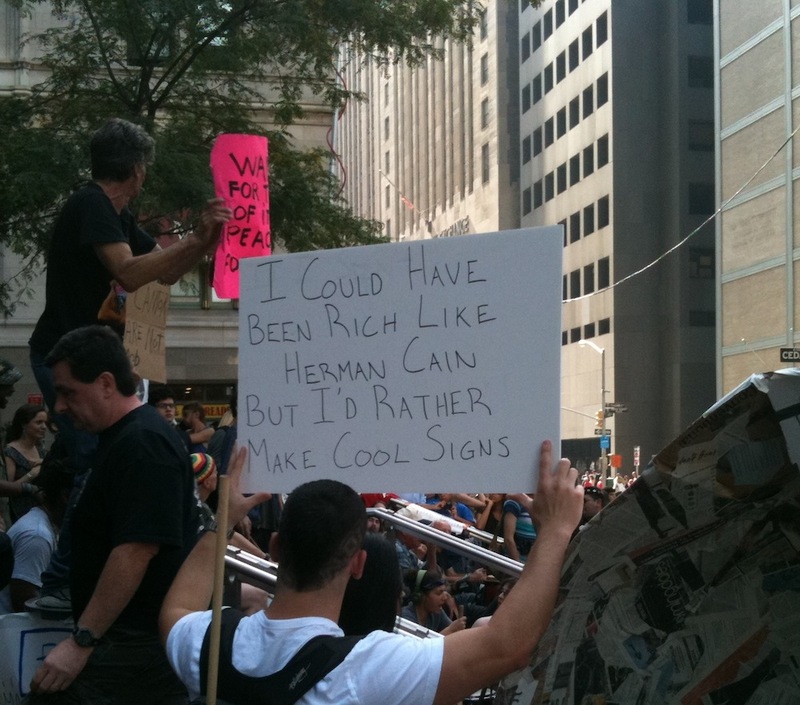 He spent a week at the protest before setting up shop. “I just saw people kind of milling about, not sure what to do,” said Badger, 38, who lives in Chelsea and has the kind of young, bright face and clipped choreography of speech that you would expect from … well, a professional dancer. He grabbed a few of his classmates, printed up some fliers, started a bare-bones website and began putting in 14-hour days. So the table has turned into a human resources department of sorts for the protest, directing people to the various jobs, projects, outreach programs and working groups that have turned the park from an ad hoc movement into an intricate game of Populist Sim City over the past month (a recent flier listed 17 current working groups, from “media” and “security” to “library” and “internet”). Echoing the sentiment found on many of the cardboard signs around her decrying the plight of the 99 percent, Yamrom found herself with extra time to spend at the park lately after being laid off from an education services company. She said meeting people at the table is similar to a life coach session in that she’s having authentic conversations about stuff that’s important to people — except, of course, it’s coming in machine-gun-fire succession in the park. So protesters get a sense of purpose and the movement gets more focused staffers instead of just more people milling around holding signs and screaming at Fox News cameras. What do the life coaches get out of this? Perhaps, it’s more exposure for a relatively new profession that walks the line between psychology and counseling. The International Coach Federation lists more than 7,900 accredited coaches worldwide; compare that to the 93,000 practicing psychologists in the Unites States alone, according to the American Psychological Association, and about 22,690 people employed in the psychiatry field nationally, according to the Bureau of Labor Statistics. Give pizza chants. Photo by Tim. From there, Badger and the others are able to do things like hook up an architect with the protest’s town planning and sustainability groups or encourage another artist to start her own table collecting short statements from protesters to catalogue on a website. In other words, it’s not just discovering what can people do to help out, it’s finding what they can do to help out that also makes them happy. “People are not expecting that that is what their role could actually be,” he said. Badger does have some of his own professional clients, but he put them on hold for the duration of the movement. They’re all supporting him so far; in fact, the International Coach Federation is sending more coaches to help staff the table. “It really sparked the entire school,” he said. So, now for the unavoidable question everyone in Zuccotti hears from a reporter: how long do you plan to be here? Both Badger and Yamrom said they would stick around until they see changes happen. Like everyone who comes to the coaching station, the movement may still be seeking its ultimate purpose. And unlike the two guys from State Island farther down the sidewalk who asked a passing reporter if he could help them get beer from the corner store or sell them pot, the life coaches seemed to be having a genuine impact. 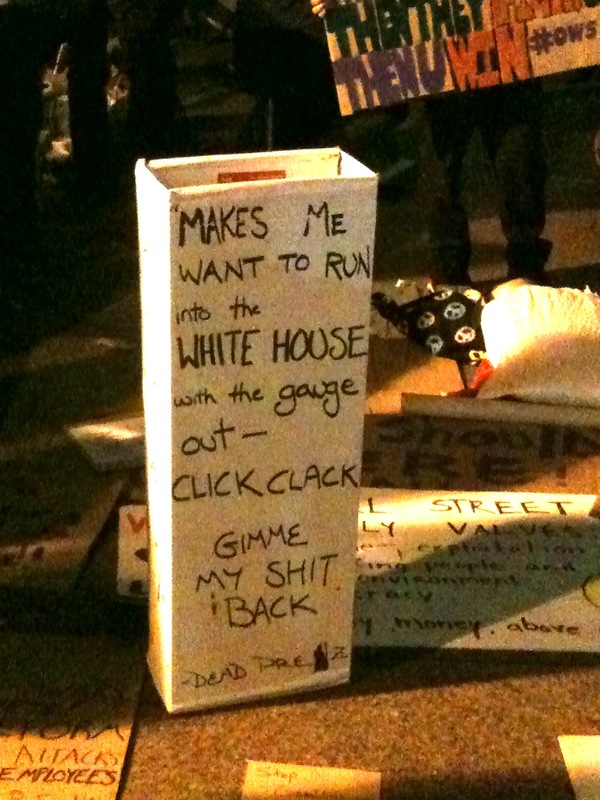 This entry was posted in actual occurrences and tagged life coaches, occupy wall street, zuccotti park. Bookmark the permalink.